No one at a radio station is going to play your music unless it's on CD. If you don't already have a record deal, and thus a someone else to do the job for you, there are tons of places to get your tunes put on a disc and placed in a sweet-looking package. In fact, that's what we do, so drop us a line! Or, google search "CD packaging + city name" and see what you can find. There are lots of companies that offer inexpensive pressing and that allow you to fit your artwork onto a template that they provide (click here and here for our previous posts about tools for artwork.) Creative freedom! Note: When considering the style of your CD, it's best to make sure the packaging has a spine, because then when it's added to a radio station's library, it can easily be seen. Also known as a "press sheet", a One Sheet is basically the industry term for resume, and is most prominently used by bands and distributors to try and sell an artist or record. Essentially, it is a summary of what a band is about, but like the name suggests, is limited to just one page, so be precise. Best advice? Keep it simple. For an example, click here. Most major colleges and universities have radio stations, so finding your local ones shouldn't be too difficult (if you're not sure where to find this info, check out our Ontario college radio guide here). Make a list of the ones that interest you and who you can afford to ship to. Now's the tough part: deciding which specific shows to send your stuff to is an essential to getting play time. Take a look at the radio station's website and get acquainted with the types of shows they offer. The more time you spend researching the shows, the more you get to know the interests of the hosts and the better the chance that you will succeed at getting your music on the air. It's also a good idea to get in contact with said host, because they can give you advice about what they're looking for, as well as the details about their submission preferences. Contact also means the host will remember you when your CD finally arrives at the radio station. Just to be safe and show off your awesome manners, write a cover letter addressed specifically to the host of the show you've chosen, explaining your intentions. Attach it to your One Sheet. Now that you're through with most of the dirty work, it's very important that you follow up, whether by phone or by email, and let the station know that you mean business. It's also important to let your fans know that you've gone ahead and submitted your CD to a college radio station so that they can request your music. Think about it: if the station's hearing about your band not just from you, but from random other people, then you're sure to create some buzz. Good luck! Don't worry. You're gonna be so famous. Running into trouble with your planning? Confused about a step? Email (info[at]firebrandinc[dot]com) or call us (416-962-5200) and we'd be more than happy to help you put together a most perfect press kit. 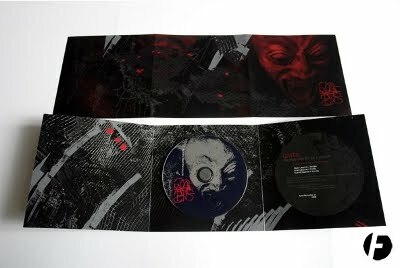 Image: the packaging we did for the amazing noise act, GATES. Listen to this stuff, I'm serious.